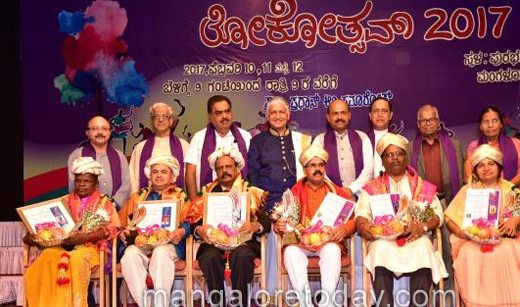 Mangaluru, Feb 14, 2017: Reports have come in on the three-day Konkani Lokotsav 2017 which ended on a high note on Feb 12, Sunday at Town Hall in the city. Roy Castelino, president, Karnataka Konkani Sahitya Academy in a welcome to the valedictory stated the Konkani Lokotsav event was held this time in a unique high profile format for 3 full days. "The news the three-day event spread to very end of the region. Cultural artistes came from many parts of the country and performed here memorably.. Not less than 40 achievers were conferred with an award for their contribution to Konkani. It is known that Konkanis are very affectionate, gifted and cultured . Konkani folk who are away from home too must adopt the language in their homes. We in this academy worked hard to achieve certain goals during my tenure as the president of the Konkani academy. Konkani language in the pre-university syllabus and a Konkani Bhavan are my top priorities which are pending. I request chief whip of Karnataka Legislative Council MLC Ivan D’Souza to help in achieving the goals." Cyril G Sequeira (CGS Taccode) (Konkani literature), Vasudev Shanbagh (art) and Clara Siddi (Folk) were presented the Honorary Awards. 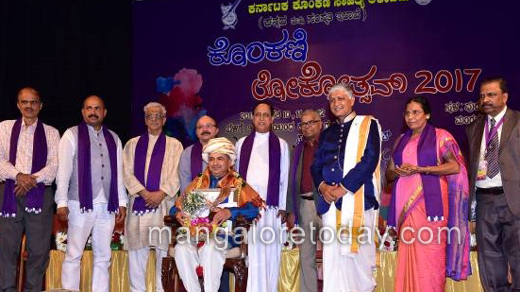 Kasargod Chinna (for the translation of ’Kannadachyo Thees Kaaniyo’), Agnesia Frank (for the research study book ’Amruth Thujya Hathim’) and Umesh Nayak (for the book of Konkani epic titled ’Shri Srinivas Kalyan’) were honoured with Book Awards. The Honorary Award is made up of Rs 50,000, a shawl and a citation while the Book Award carried a cash prize of Rs 25,000 and a citation. DK District in-charge minister B Ramanath Rai said, "Konkani is spoken by people of different communities about 40 in the country. Today there are many differences among people, language can unite. The contribution of Konkani speaking people in the development of this district cannot be ignored. Awards like these boost the morale of people working in the community and will encourage them to work for better causes." MLC Ivan D’Souza who spoke on the occasion lauded Roy Castelino’s hardwork for the Konkani academy. "A range of programmes held under the guidance of Roy are a bog achievement. The community should encourage and participate in Konkani related programmes. Our top two priorities would be introducing Konkani in the PU syllabus and setting up the Konkani Bhavan. I will discuss the matter with our CM." North Mangaluru MLA Mohiudeen Bava expressed his gratitude to Konkanis for programmes like Konkani Lokotsav that spread unity among people. 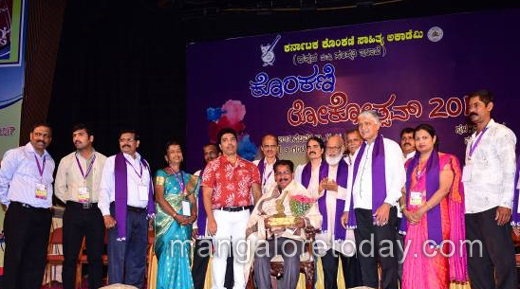 "The Konkani speaking people in Dakshina Kannada have achieved in great measures. Let be academic, medical, engineering and dental colleges or foods and ice creams, Konkani speaking people are in the fore frount." On behalf of the awardees, Cyril G Sequeira thanked Konkani Sahitya Academy and congratulated all concerned. He said, "The Konkani academy has achieved much in recent times. All concerned have been working to expand our language and culture. Read Konkani, speak Konkani and live Konkani should be the aim." Jagganath Shenoy, president, GSB Sabha, Mysuru, said, "Konkani speaking people are known to be gifted intelligent people. We are in all nations and corners of the globe, be it eduvation, finance and much more. Konkani is our ’Mai Baas’ (mother tongue) and it should be spread from for posterity. One should be proud to be born as a Konkani." Mangalore diocesan vicar general Msgr Denis Moras Prabhu, former president of Konkani Sahitya Academy Eric Ozario, banker and president of Fudar Pratishthan John D’Silva, senior Konkani leader C N Shenoy, founder of World Konkani Centre Basti Vaman Shenoy, registrar of Konkani Sahitya Academy Devdas Pai, president of Tulu Sahitya Academy Janaki Brahmavar, members Geetha Kini, Vittori Karkal, Loius Pinto and others were present. The three-day Konkani literary and cultural festival - Konkani Lokotsav - showcasing the Konkani communities and culture on the 3rd day show cased the rich folk dances of Siddi, Kudmi, Kharvi, Huluswara and other tribes and communities were showcased along with a variety of dances, songs, instrumental music and Konkani traditions. 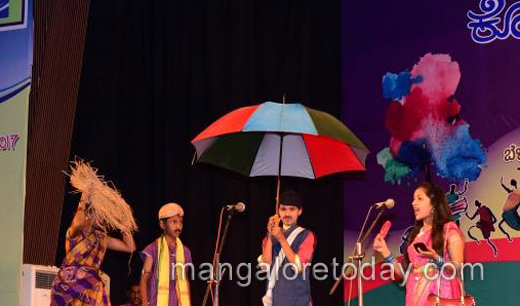 Konkani food, costumes, customs, utensils, traditions and practices were showcased at more than 55 stalls, the three-day extravaganza will go down in the history of Mangaluru city.